Marshall placekicker Kaare Vedvik boots and extra-point attempt during an Oct. 14 Conference USA football game against Old Dominion in Huntington, W.Va.
Marshall wide receiver Willie Johnson (1) is up-ended by a Miami (OH) defender during a first quarter catch Saturday, Sept. 2, at Joan C. Edwards Stadium in Huntington, W.Va.
BOCA RATON, Fla. — The turnover bug bit them again. 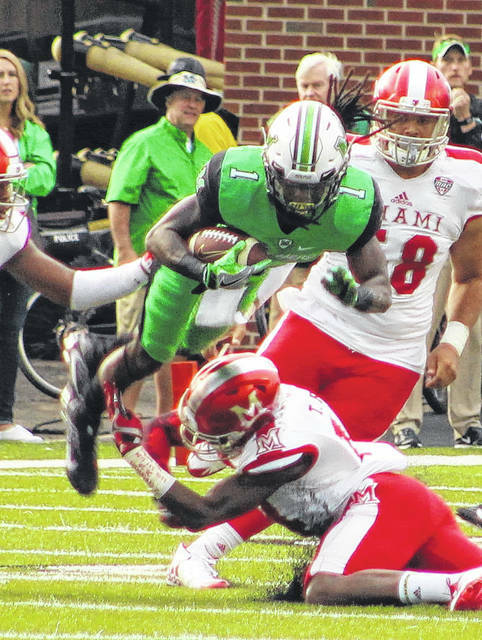 Marshall committed four turnovers that resulted in 16 Florida Atlantic points, allowing the hosts to earn their first-ever victory over MU on Friday night during a 30-25 decision in a Conference USA East Division contest at FAU Stadium in the Sunshine State. The Thundering Herd (6-3, 3-2 CUSA) dropped their second straight decision and are now minus-7 in turnover differential over that span, as the guests had four Chase Litton passes picked off in a game that the Green and White never led. The Owls (6-3, 5-0), on the other hand, are sitting alone atop the league standings after producing their fifth straight victory and their seventh straight contest with 30-or-more points. FAU started its up-tempo attack on the opening possession of the game after covering 74 yards in 16 plays, with Jason Driskel capping things with a 2-yard touchdown run at the 9:50 mark for a 7-0 edge. Jalen Young picked off a Chase Litton pass on the ensuing MU drive and returned it to the hosts 19-yard line, then Willie Wright scampered that distance on the next play as the Owls secured a 13-0 cushion with 6:32 left in the first quarter. The Herd followed with a 13-play, 61-yard drive that went into the early moments of the second quarter, but Kaare Vedvik missed a 31-yard field goal with 14:16 left in the half. Vedvik redeemed himself on Marshall’s next possession after converting a 28-yard field goal, capping an 8-play, 44-yard drive at the 7:09 mark for a 13-3 deficit. Marshall forced a punt on the next possession, but took the ball over at its own two with 5:11 remaining in the half. The Herd put together an 11-play, 55-yard drive that ultimately ended when Shelton Lewis picked off a Litton pass at the FAU 22. The Owls got a huge 66-yard run from Devin Singletary on third-and-8, then Greg Joseph converted a 31-yard field goal with three seconds left that gave the hosts a 16-3 edge at the break. 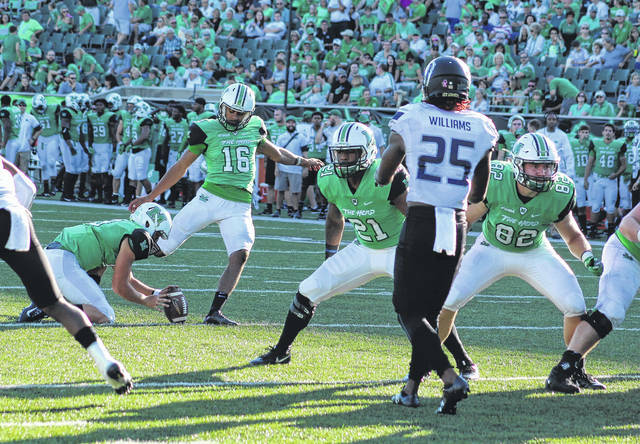 Marshall claimed a slim 11-10 edge in first downs in the first half, but the Green and White was minus-2 in turnover differential and also had five penalties for 32 yards. FAU, conversely, scored 10 points on takeaways and had just one flag for five yards. The Owls held a small 209-202 edge in total yards of offense, but FAU was substantially better on the ground with a 145 rushing yards on 26 carries. MU produced only 50 rushing yards on 18 totes. Marshall took its first possession of the second half and marched right down the field, covering 75 yards in seven plays. Ryan Yurachek hauled in a 5-yard TD pass from Litton on second-and-goal, allowing the guests to close to within 16-10 with 12:10 left in the third period. The Herd followed with an onside-kick that Vedvik recovered himself, allowing Marshall to again have possession at its own 46. The guests strung together a 9-play, 54-yard scoring drive that ended with a 1-yard TD run from Keion Davis. Vedvik, however, missed the PAT — which led to a 16-all tie with 7:27 remaining in the third canto. Both teams traded punts, with the Owls taking over possession at their own six following a booming 59-yard punt by Vedvik — his first of only two punts in the contest. Florida Atlantic, however, answered with some creativity as wide receiver Kamrin Solomon found Singletary on a 60-yard TD pass with 2:25 remaining in the third. The wide-receiver pass capped a 3-play, 94-yard drive that gave the hosts a 23-16 advantage headed into the fourth. MU forced a punt at the beginning of the fourth, but Litton threw his third interception on the following snap as Young came away with his second pick — giving FAU possession at its own 41. Six plays and 41 yards later, the Owls had a two-possession cushion following a 13-yard scamper by Singletary on third-and-goal — making it a 30-16 contest with 10:37 left in regulation. The Herd responded with a 14-play, 75-yard drive that ended with a 15-yard TD pass from Litton to Yurachek on fourth-and-10, allowing the guests to close back to within 30-23 with 5:16 remaining. Marshall forced a punt on the ensuing drive, but Litton threw his fourth interception of the night on a fourth-and-six try from the MU 23. Young came away with his third and final pick while giving FAU the ball at its own 43 with under three minutes left. The hosts intentionally went backwards to run clock as MU was out of timeouts, then chose to take a safety by running out of the end zone with just eight seconds left in regulation. Marshall took the ensuing punt and exchanged several laterals to keep its chances alive, but one of the laterals ended up being a forward pass — which resulted in a penalty and the end of the game. The Herd finished the game with a 21-17 edge in first downs and also outgained the hosts by a 381-353 overall margin in total offense, but the Owls claimed a sizable 189-128 advantage in rushing yards. King led MU with 72 rushing yards on 22 carries, while Litton finished the night 20-of-39 passing for 253 yards with two TDs and four picks. Marcel Williams led the wideouts with four grabs for 122 yards. Singletary ran for 203 yards and a score on 28 carries, plus led the wideouts with 72 yards and a score on two catches. Driskel was 11-of-17 passing for 104 yards with no TDs or picks. Marshall — currently in its first losing skid of the season — returns to action Saturday, Nov. 11, when it hosts Western Kentucky at 6:30 p.m.